Love the high ceilings and the waterfall view, originally uploaded by Camemberu. 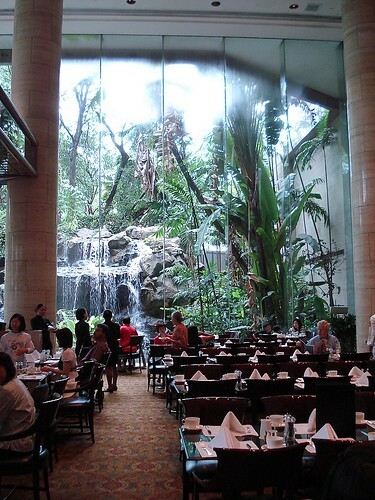 The Dining Room at Sheraton Towers boasts high ceilings and a grand view of cascading waterfalls and landscaped tropical gardens. We ended up here by chance and went for their high tea (noon to 4pm, Saturdays, S$28++ for adults, S$15++ for kids aged 6-12). 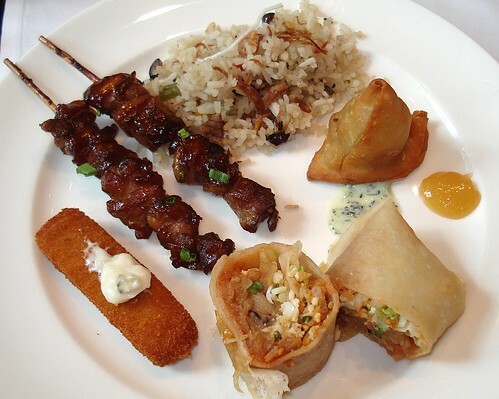 Mains (from top): seafood olive rice, samosa with mint and mango chutney, popiah, fish finger, yakitori, originally uploaded by Camemberu. It's not a very wide spread and consists mainly of Asian fare. I'll just quickly run through the highlights. The mains are quite forgettable although the popiah was all right. Didn't get to try the carrot cake. 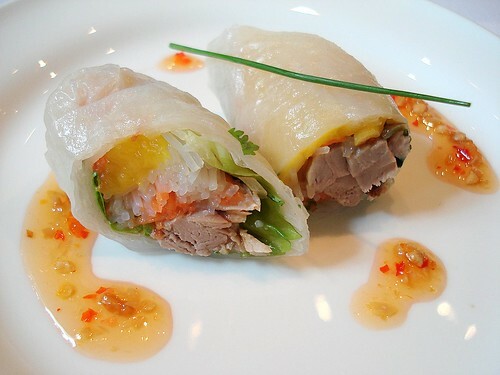 Vietnamese rice paper roll with roasted duck and mango, originally uploaded by Camemberu. A chef at a live station will serve you Vietnamese rice rolls with roast duck and mango (basically cut it in half, drizzle chili sauce and put single chive on it). Nice cold appetiser, if you can get past the slightly dried out rice roll skin. 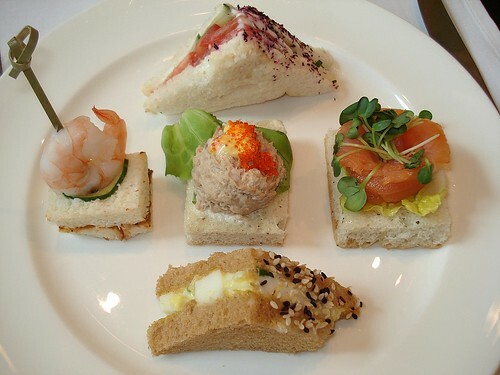 Assorted sandwiches (from top) - tomato and cucumber with ume shavings, prawn and otah, tuna with tobiko, smoked salmon and cress, egg-mayo with sesame, originally uploaded by Camemberu. The finger sandwiches were surprisingly tasty. Slightly more innovative than the usual catered fare. I appreciated the use of interesting final touches like ume (Japanese preserved plum) shavings and Japanese pink fish floss (not shown). 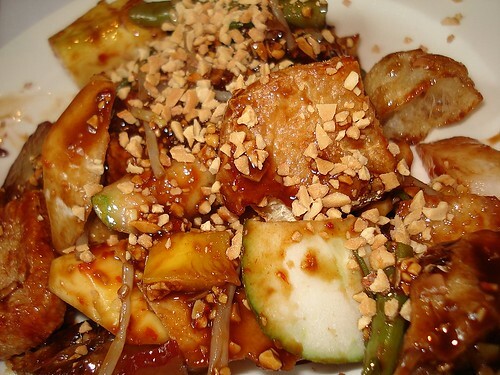 DIY Rojak - toss your own Asian salad!, originally uploaded by Camemberu. Hubby loved the rojak. It's a DIY station, so you can customise your own ingredients - add more tart mango cubes or jambu ayer (rose apple) slices if you like. Thumbs up. 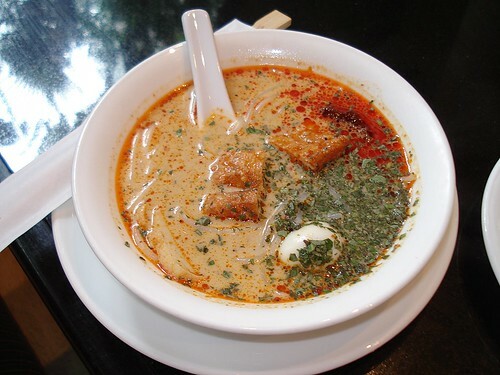 The laksa is not bad!, originally uploaded by Camemberu. I enjoyed this. The hotel bills this as their "famous Sheraton Towers Laksa", although I never knew it was. Famous, that is. Chicken dumpling, originally uploaded by Camemberu. Mini glutinous rice dumplings with braised chicken inside. Tasty but I think pork makes a better filling. 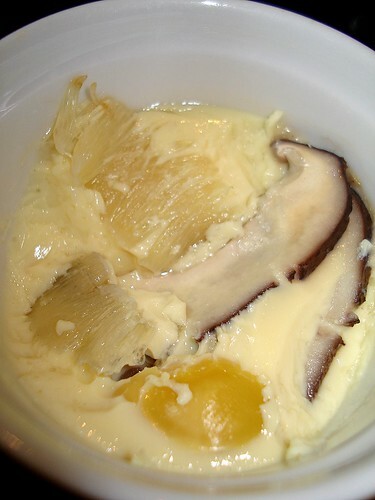 See the mini-combs of sharks fin in the chawanmushi?, originally uploaded by Camemberu. This is the most generous portion I have seen in terms of shark's fins in any dim sum. Visible little combs of it adorn the chawanmushi cups. Bargain lovers will be happy! However the texture of the steamed egg is the roughest I have ever come across and the flavour is not stellar either, despite lots of crab meat at the bottom. 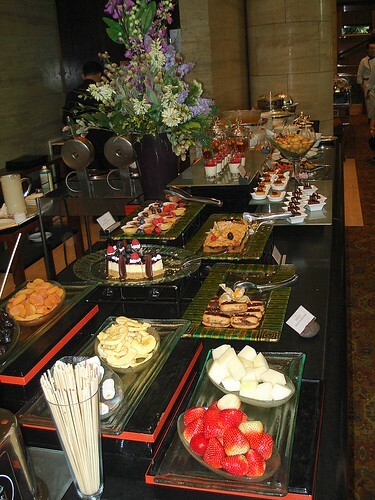 Part of the dessert section, originally uploaded by Camemberu. Dessert lovers will rejoice that more than half the buffet is all about sweets. Pity I wasn't able to try all of them. 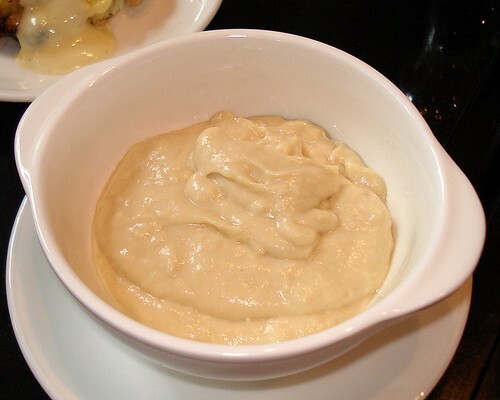 Durian pengat (mousse), originally uploaded by Camemberu. Ahh, they have the durian pengat here. Durian pulp mixed with gula melaka and cream to create a light mousse. This seems a fairly light version, not overly pungent, but you will still need a palate cleanser if you want to taste anything else afterwards. 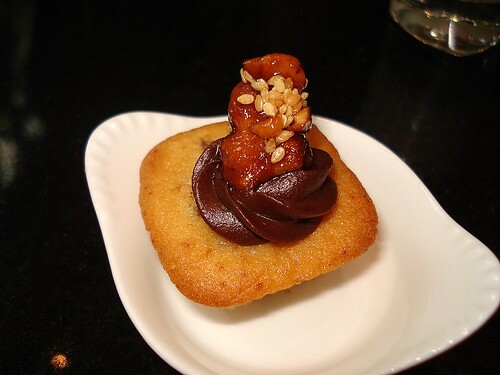 Longan cake with sesame walnut, originally uploaded by Camemberu. I had a brief thought about the bitesize desserts. All that effort into creating that little morsel and it's gone in two seconds. How transient everything in life is! Shotglass desserts, originally uploaded by Camemberu. 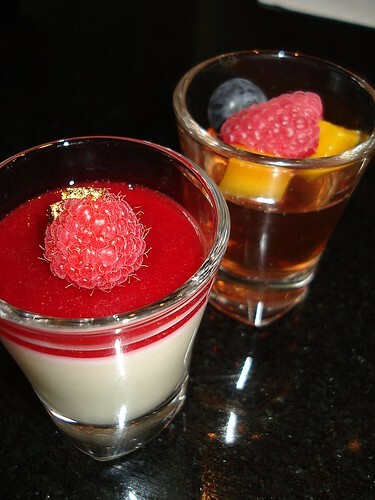 Nice shotglass desserts - raspberry with ivory chocolate mousse; and champagne jelly with fruits. 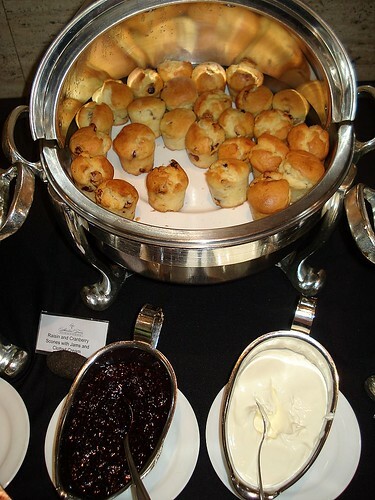 Raisin and cranberry scones with jam and clotted cream, originally uploaded by Camemberu. There were many desserts I did not get to try, including this. Also missed - pulut hitam, chocolate fountain, waffles station, all the cakes, pies and tarts. Did have the bread and butter pudding with vanilla cream but it was just average. 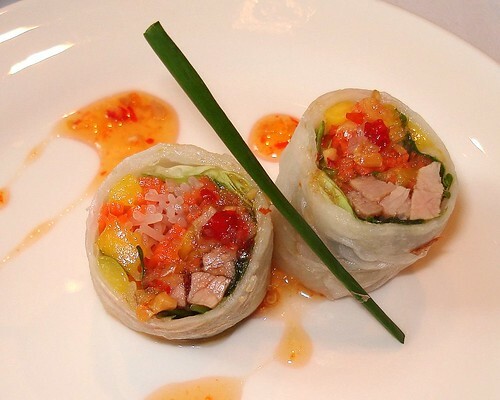 Vietnamese rice paper roll with roasted duck and mango, second helping!, originally uploaded by Camemberu. I couldn't help taking a second helping of this, even after the desserts. Love rice paper rolls! 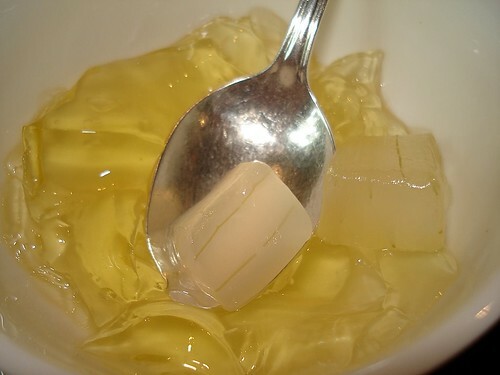 Lemon jelly with aloe vera cubes, originally uploaded by Camemberu. We finished off with this refreshing jelly. Wish I had the tummy space and time to try all the other stuff, but Nadine was getting cranky, so we had to cut short our meal. Would I be back again? Hmm, I'm not sure. There are just so many other high teas to check out! it looks good! how much is the high tea? Ah sorry, forgot to put the price in. It's S$28++ for adults, S$15 for kids (aged 6-12). Will include this in main text now. looks not bad, but then the variety doesn't seems to be a lot? Lady-i: you're right, it's not a lot but still enough to eat for S$28. No sashimi or meat-heavy mains though. this looks like such a lovely place to dine! I love rice paper rolls. 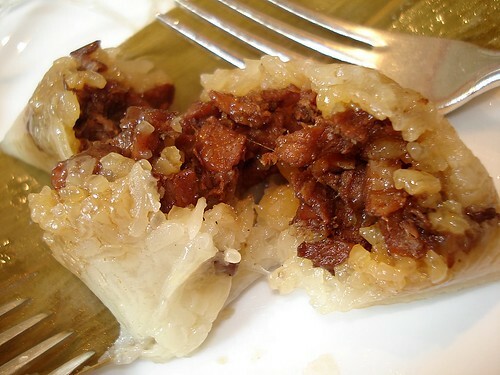 Every time I try to make them at home, I get frustrated with the uber sticky rice paper! this high tea avaiable on weekday? Anon, I think it's Saturdays only (I checked my high tea list) but you can always call to verify. gonna try this next week! was wondering if there's any dress code to take note of? Hi dean, there's no stated dress code. I think smart casual should be fine. which we think it is not worth for this quality.